Last week, at an event held in Cartagena de Indias, Colombia, the company introduced two new models of Blackberry phones, Blackberry Curve 9220 and 9320 in Latin America. RIM is introducing these new Curve models around the world. As they have already launched these 2 models in India, Indonesia, UK, Philippines and now it has made its way to Latin America. They are the first and so far, only phones with Blackberry OS 7.1. The combination of enhancements to the OS 7, together with a better hardware, have significantly stabilized the device. With the Torch 9800, for example, was common to see crashes and applications that became unresponsive; thing I have not experimented with the Blackberry Curve 9220, at least so far (512 MBs of RAM really help). These 2 phones are quite similar in design to the above: light and small. A physical difference is that now have a button to the “Push To Talk” we usually see on Nextel but rather serve to radio, leads directly to BBM. A second press of the button, we will send through BBM, an audio message. Wifi Hotspot built (only model 9320) – Now you can use the curve as a 3G modem for connecting other devices to the Internet. Parental Control – You can restrict functions such as browsing or downloads. FM Radio – A feature that was surprised at the Blackberry Curve 9300, the Blackberry Curve 9320 and 9220 bring back FM radio. The big difference between Blackberry Curve 9220 and Blackberry Curve 9320, is that the 9220 is only Edge (2G) and has no options Hotspot, which are present in the model 9320. It is strange to see a model 2G 3G today that has expanded considerably in the region. 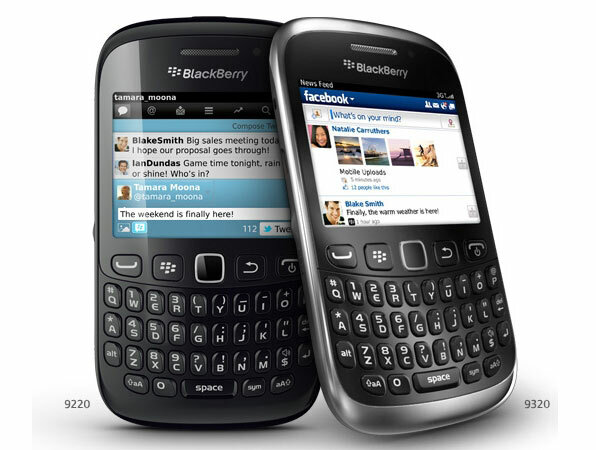 B oth smartphones offer the usual pack of social apps and services, but also come with a new dedicated BBM key, which sets them apart from other BlackBerry 7 devices. As for CPU / RAM, both have the same characteristics, they finally seem to have settled in these economic models, the performance problems that often plague the Blackberry OS. Blackberry Curve 9220 and Blackberry Curve 9320 phones, as you can see, point to a market of mid-range devices, as it has done the Curve line and it continues to exploit the features that make it popular model: low price, good keyboard, wireless social networking.